The Time Machine has two first-person narrators, both nameless but both male and at least relatively well-off. The story begins with the first narrator who comes to the house of the time traveler and meets other people there. The time traveler talks about traveling through time and the others think the whole idea is ridiculous. The people leave. Later, the first narrator returns to the time traveler’s home and again meets other people and later the disheveled time traveler who tells the others about his journey to distant futures. The traveler is so sure that the future will be good for humans that he doesn’t take any equipment with him. He just has a box of matches in his pocket but that’s all. The time traveler tells about the year 802701 in the future where he first meets small, beautiful but not very smart humans. They live in deteriorating buildings and eat mostly fruit. They don’t work; instead their time is spent frolicking in meadows and rivers. But they fear the dark. Soon, the time traveler meets another race of small, ape-like people who live underground in darkness. He makes observations but also draws conclusions based on his own biases and expectations, as a wealthy man in Victorian England. Later, he briefly travels further in time to witness the end of Earth. While the story has some exciting passages, it’s not really an adventure story. The traveler draws very intricate conclusions from small evidence. Also, he sees only a small part of the world and yet supposes that everywhere is the same. The story doesn’t really have character development; in fact the future seems to confirm the traveler’s expectations and ideas, that strife and hardship are good for humans and if they’re done away with, the human race will degenerate. This a perfect example of idea based story. It’s the first time travel story so Wells is focused on showing off his idea rather than on the story and characters. However, these days most, if not all, readers are already familiar with the concept so they expect more. The influence of the idea is, of course, great. It’s now an accepted part of not just science fiction books, but TV-shows, movies, comics, plays. 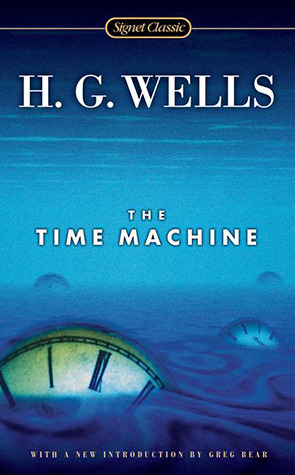 The story is available for free at Project Gutenberg as are all of H. G. Wells’ books. I love the original movie, but I don’t think I’ve ever read the book! Good to know that the first movie is good. I haven’t seen any of them but now I’m tempted to watch them.